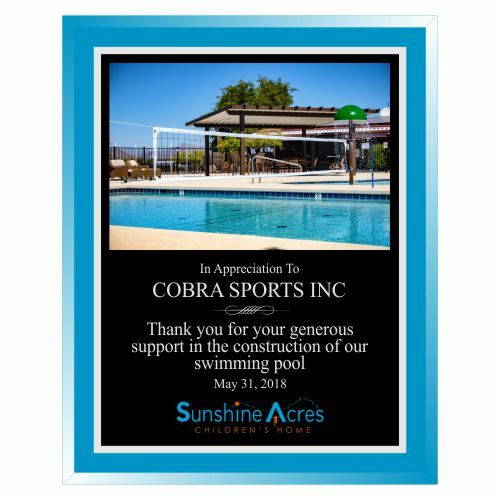 One of our many valued customers, at Sunshine Acres Children’s Home,asked us to come up with a unique idea to thank some contractors in the Phoenix area for building a swimming pool for children on their property. We were excited about the project, and figured this would be a good opportunity to show off some of Newline Trophies’unique capabilities. 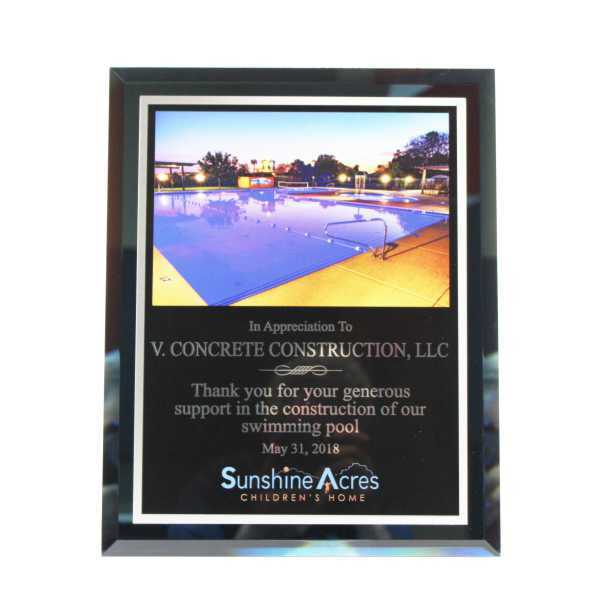 The people at Sunshine Acreswanted a custom plaque the contractors could hang on their wall, and had several photos of the new pool they felt would look nice on the plaque. At first, they were expecting an acrylic cover over a standard paper photograph, but we had another idea. Their budget allowed for an up-to-12” x 15” display, with a nice plaque board and fully- engraved, direct-printed plate. Our first order of business was to help them choose the right photo, which in this case was easy because all of their images were made professionally, with a high-quality camera and, a couple of them were shot when the lighting was just right. We chose these photos because of their beautiful colors and suitable representation of the contractors’ work. Because we are meticulous, on custom projects we often create virtual proofs. These enable our clients to get a sense of what the finished product will look like. It also helps to eliminate any miscommunication. 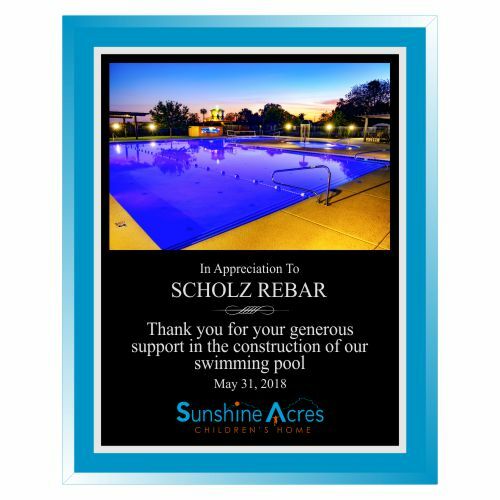 As we were creating the virtual proofs, our client informed us that one of the plaques would require a special photo for the contractor who donated the pool net. Since the image was outstanding, inserting another photo into the proof was relatively simple. Below are the two virtual proofs. They show how the blue mirror plaque and silver aluminum background complement the black, laser-engraved aluminum with full-color, direct- printed logo. It is evident that these were the right choices. 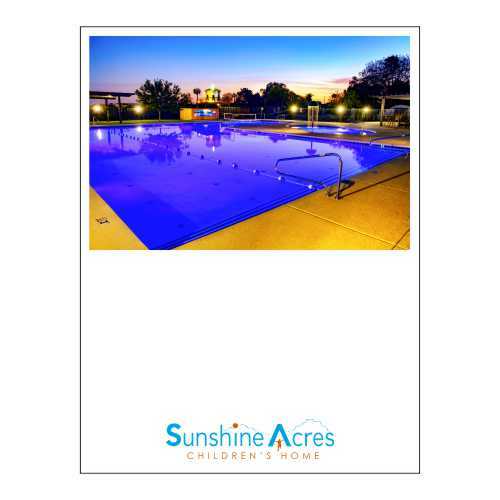 With quick approval from Sunshine Acres,we were ready to “work our magic.” After procuring the appropriate materials, we began creating the print and laser files to make it happen. Below are the images of the files created in order to direct-print the full-color photograph onto the black laser-engraved plate, and the laser file used to engrave the text. With our files ready to go, the Newline Trophyteam made one additional check-up in order to be certain the spelling was accurate, and then the order went into production. 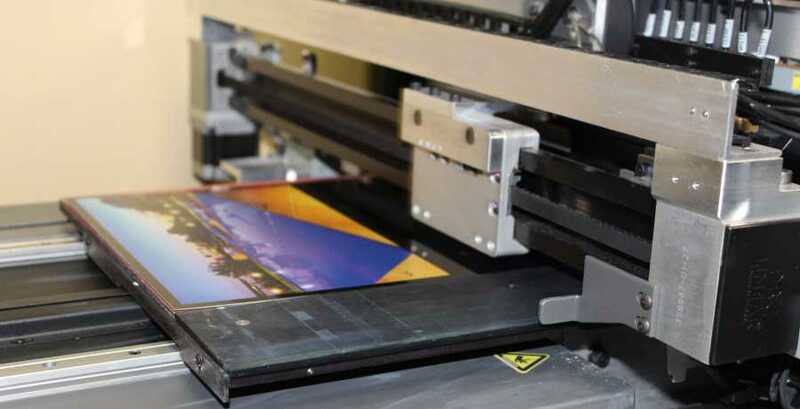 This image is of our direct-print machine printing the photograph and customer logo onto the laser-engravable plate. 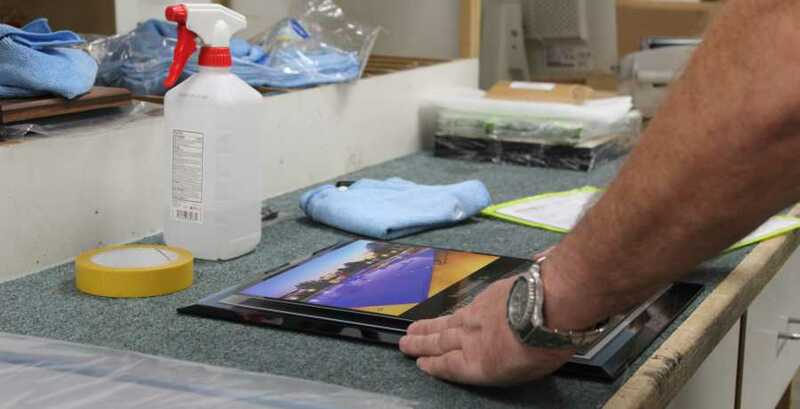 This machine is very accurate, and is capable of creating beautiful, full- color images on metal, acrylics, glass and plastics. 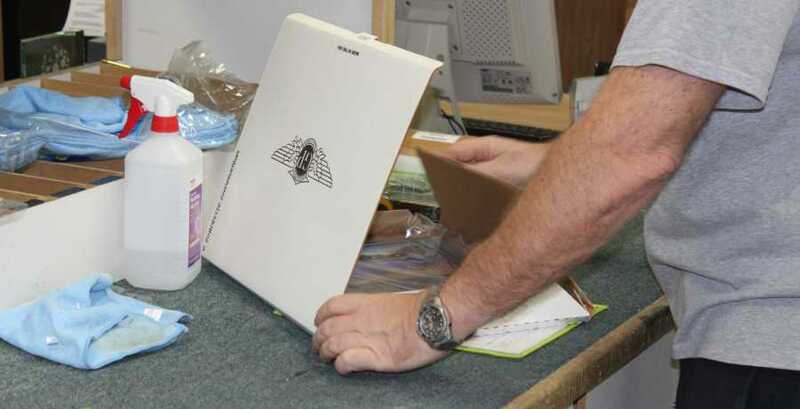 Once printed, the plaque plates are sent back to the engraving room for the second step in the production process. Laser-engraving metal plates is one of our specialties, and in this instance it proved to be the right choice for Sunshine Acresbecause we were able to get a nice, polished silver-engraved image that lent symmetry to the silver background behind the engraving plate. NewlineTrophy.com is known for our metal engraving, and though we chose laser engraving for this project, we often will choose industrial diamond, burnish, or laser-engraving, using a chemical on stainless steel to bring the carbon to the surface and make it permanent. Below is an image of one of our laser engravers removing the black surface to reveal beautiful silver text on the metal plate. Once we have the printing and the laser engraving complete, it’s time to assemble, polish and package the plaques for delivery. These images represent the final stages of our custom plaque project. And when all was said and done, shown below is the final product presented to our customer. 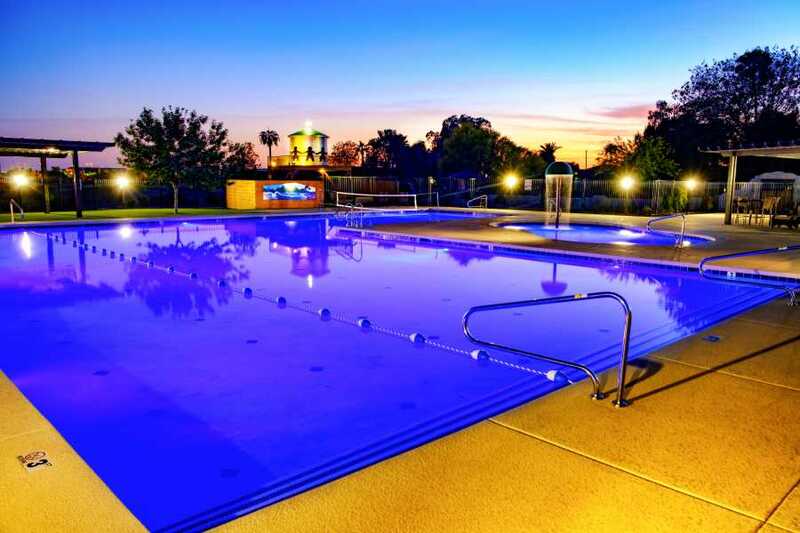 You can see how the blue mirror reflects back, as would water in a pool. We hope you enjoyed seeing how this project was executed, and we would be delighted to talk to you about your next custom trophy, plaques or award needs. For custom acrylic trophies, crystal trophies, paques, engraved metal plates, printed plastic signs, engraved plastic signs and name tags, Newline Trophyis ready to handle your job, and will take great pride in making sure it is of the highest quality.